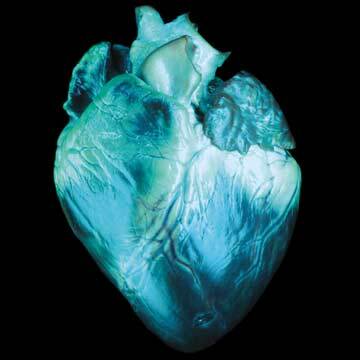 Most pig hearts aren’t blue—this one has been colorized for dramatic effect. Still, comparable in size to the Homo sapiens version, they could one day save human lives. Over millions of years, porcine endogenous retroviruses (PERVs) have taken up residence in the DNA of pigs. These dormant viruses don’t bother the pig. But what if, transplanted with an organ into a different species, a PERV were reactivated and became pathogenic? That’s the worst-case scenario for xenotransplantation from pig to human—that it could give rise to a new cross-species disease. Any transplant, including human to human, carries some risk of infection, and several pig disease can also infect people—swine flu, for example. Yet while most such cross-species transmissions can be controlled or eliminated, there has been concern that PERVs could make the trip from pig to person. That risk caused the U.S. Food and Drug Administration to place all xenotransplantation trials on hold in 1997; various European governments took even stronger action. That year, the British virologist Robin Weiss showed that, under some conditions, PERVs can infect human cells grown in the lab. This risk might be increased in someone whose immune system has been suppressed by antirejection drugs. Weiss also argued that Gal-free pig organs, by circumventing another layer of defenses, might be more efficient conduits for viruses. Tests of patients who have been given pig brain, liver or insulin-producing cells have so far shown no evidence of PERV infection. Pig-to-baboon transplants have also come up clean. And xenotransplantation researchers are now using various genetic techniques to disable the PERV DNA. For anyone considering a lifesaving transplant, the risk seems minuscule. But policymakers have to think not just of individuals but of the entire population. The trials placed on hold in light of Weiss’s research findings were allowed to continue once they satisfied revised FDA requirements.